The featured leash is made in the U.S.A. by the best leather craftsmen in the world, "The Amish" - Mt. Hope, Ohio. 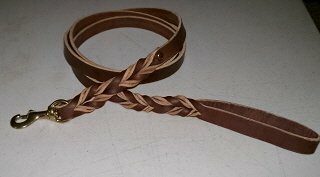 This braided leash is a standard 6 foot by ¾ inch obedience and/or working dog lead. The leash is made with the highest quality latigo leather and hardware. We rivet our leashes at the handle and bolt snap to hold down the braiding tab. The strength is actually in the double braiding. In addition, with the pliable latigo leather and combined beveled edges, our leash is designed for hand comfort, be it for 20 minutes of k9 work or all day long k9 handling. This lead is the #1 choice of many professional trainers and K-9 handlers, across the USA, Canada, and Europe. We are so confident with the superior quality of this leash it comes with a lifetime guarantee. Best Customer Service on Amazon. Call or Email if interested in matching professional collar(s), and/or the same leash in 4ft. length.